Small yards are without boundaries on wishful design and purpose. Mandi Golman and Jade Florence from Yarrow Landscaping scope out ideas for privacy, living spaces, water retention and floodwater control in small, contemporary gardens. 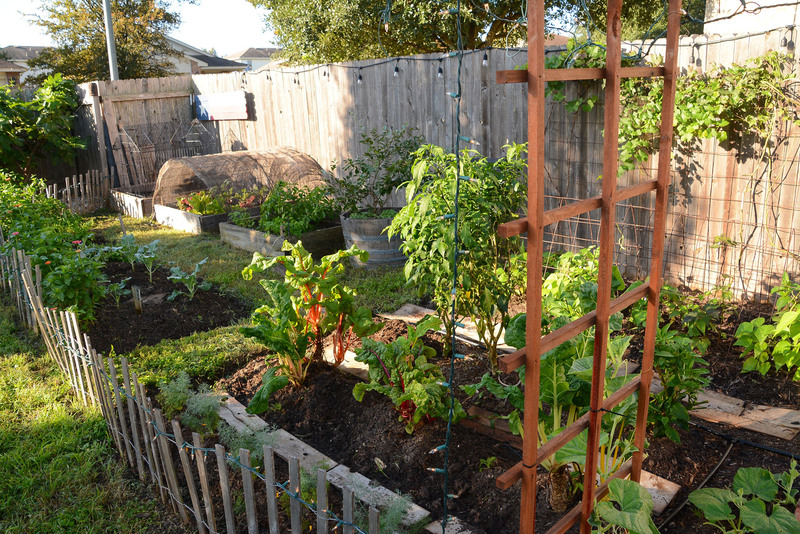 On tour, see how designer Diana Kirby responded to challenges and new goals in her home garden. Have you ever seen black soldier fly larvae in your compost pile or barrel? Daphne explains what they’re doing and why they’re attracted. 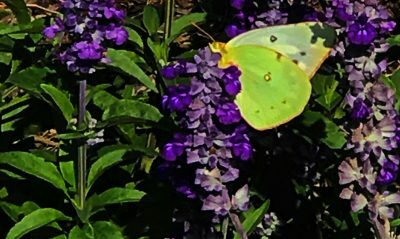 Want pollinators? See what viewers are growing to attract them. Designers Leah Churner and Colleen Dieter demonstrate how to collect seeds to celebrate the newly launched Central Texas Seed Library! And, North Carolina gardener and photographer Tonya Peele from plant + shoot illustrates how to frame those garden pictures for the best pictures around. 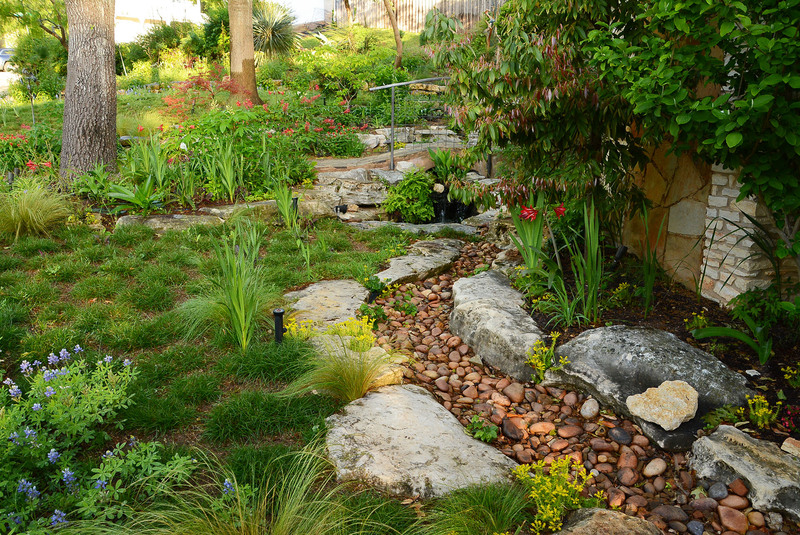 Designer and garden coach Diana Kirby started with a blank yard and lots of challenges: flooding water near the house, scrubby growth, dramatic sun and shade, flat lines, wind, and deer. See how she paired plants in sun and shade for wildlife, created family outdoor destinations, and modified her ideas and artistic touches. Small yards are without boundaries on wishful design and purpose. Mandi Golman and Jade Florence from Yarrow Landscaping scope out ideas for privacy, living spaces, water retention and floodwater control in small, contemporary gardens. What are these “worms” inside a compost barrel? When Margie McAllister was away a few weeks this summer, she returned to find clusters of “worms” inside her compost barrel. Wizzie Brown, AgriLife Extension entomologist, identified them as black soldier fly larvae. These larvae definitely aren’t hurtful, since they’re assisting with the decomposition process. But they are an indicator that the “normal” process of decomposition is a bit out of whack, evidenced by all the liquid. Composting barrels such as these work well when tumbled regularly, which helps to oxygenate the organic material, keeping decomposition on an aerobic path. But while Margie was out of town, the mixture sat, untumbled, in the heat, quickly moving over to anaerobic conditions. To get the process moving again, add some brown material, such as shredded newspaper, to dry it out a bit, and get to tumbling, to reintroduce oxygen into the system. Our plants this week come once again from our viewers who are taking care of wildlife and observing it in action! Sal Haq from Garland, enjoys his morning tea in the garden. Often, the bees join him for breakfast on his vitex tree, also known as chaste tree. Stefanie Limerick has lots of pollinators, beneficial insects, and birds thanks to her habitat garden that’s chemical free. Bees really go for the African blue basil and stick around to pollinate her squash blossoms. She found a crab spider on a coneflower and a sweat bee on the leaf of a sunflower. There are also butterflies, of course, including Cloudless Sulphur on this ‘Evolution Violet’ cultivar of Salvia farinacea. In Flatonia, Erica Rivers ordered a Texas Superstar Moy Grande hibiscus for her mom after seeing it on CTG. Mom Agnes Fajkus really loves those huge summertime flowers. In downtown Austin, Lynda Scott spotted a squirrel having lunch on a sunflower seed. Susan Velzy, in Pipe Creek, started this Yellow Bird of Paradise from seeds that her dad gave her 20 years ago from his garden in Truth or Consequences, New Mexico. 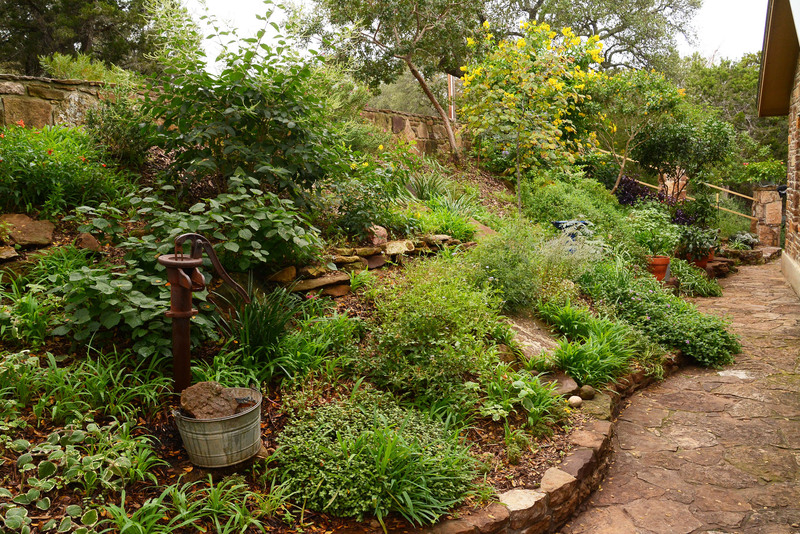 Now she’s got several pollinator-loving plants in her Hill Country Garden! Finally, in Bee Cave, Michele and Joe Wagner planted this new front porch garden with roses, gaura, blackfoot daisy, penstemon and lantana. So many butterflies and bees are coming to the plants! And the birds and bees really appreciated the fountain during this dry, hot summer. Designers Leah Churner and Colleen Dieter demonstrate how to collect seeds to celebrate the newly launched Central Texas Seed Library!